← 1 Million Raspberry PIs sold! What did Eben Upton really thought at the beginning? As reported by Venturebeat, Facebook is introducing Cards, a sort of prepaid credit card for sending gifts – social gifts, actually. Cards are like regular, plastic gift cards, except that they work at a wide range of retailers. 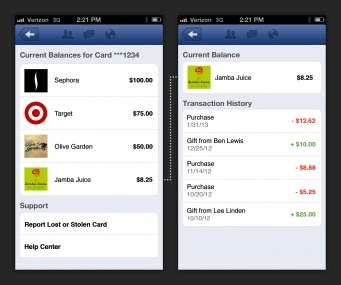 It’s like Facebook is getting into the land of prepaid credit cards via Gifts. This is a sort of deja-vù, since Cards and Gifts were already introduced by FB previously, but never like this: this credit-card-alike is likely to bring significant buzz to Facebook economy. This entry was posted in Brand, Business, Business Model, Digital life, Digital media, Economy, Facebook, Facebook Advertising, Facebook App, Facebook Pages, Financial, Shopping, social habits, Social initiatives, Social Life, Social marketing, Social Media, Social network, Social news, Social value, Tech industry, User experience, Wall Street and tagged credit card, Facebook, facebook economy, facebook gifts, gifts, prepaid card, Shopping, Social network, social shopping. Bookmark the permalink.